For the last year, I have been focused on ensuring we look at the alerts generated by Talos. For the last 6 months I have also looked a bit more carefully at the uplifts we do every 6 weeks. In fact we wouldn’t generate alerts when we uplifted to beta because we didn’t run enough tests to verify a sustained regression in a given time window. 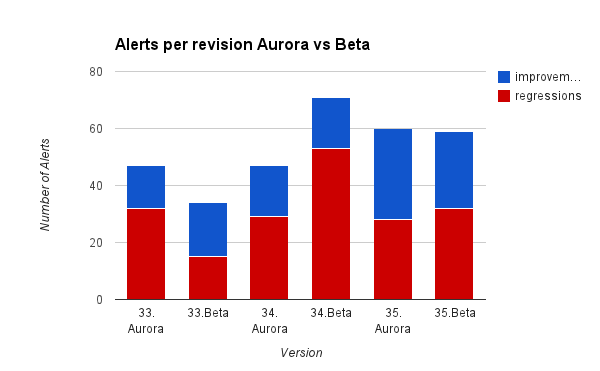 Side by side stacked bars for the regressions going into Aurora and then going onto Beta. 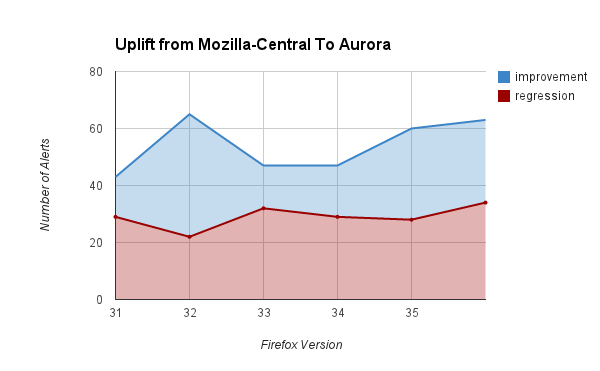 One way to interpret this above graph is to see that we fixed a lot of regressions on Aurora while Firefox 33 was on there, but for Firefox 34, we introduced a lot of regressions. As always, if you have questions, concerns, praise, or other great ideas- feel free to chat via this blog or via irc (:jmaher). Have you ever talked to someone who continues to use the same word over and over again? Then you find that many people you chat with end up using the same choice of words quite frequently. My wife and I see this quite often, usually with the word ‘Amazing’, ‘cool’, and ‘hope’. Are these words necessary in conversation? Do these words we choose lose value due to overuse? Do others who are jaded by these words associate other meanings or intentions to the words we use? do you want to show up to yoga on Saturday? are you saying this to make me feel good? are there other things preventing you from committing to yoga on Saturday? I don’t want to hurt your feelings by saying no, so to make you feel good I will be non committal about showing up to yoga on Saturday even though I have no intentions. There are many ways to replace the word “hope”, and all of them achieve a clearer communication between two people. Now with that said, what am I hacking? For the last few months I have been reducing (almost removing) the words ‘awesome’, ‘amazing’, ‘hate’, and ‘hope’ from my vocabulary. Why am I writing about this? I might as well be in the open about this and invite others to join me in being deliberate about how we speak. Once a month I will post a new word, feel free to join me in this effort and see how thinking about what you say and how you say it impacts your communications. Also please leave comments on this post about specific words that you feel are overused – I could use suggestions of words. Пост доступен на сайте softdroid.net: Язык взлома – изменение выбора используемых слов.